I am fairly convinced that my maturity levels have plateaued. I have nightmares about being taken off the family plan, I call my dad every time I have to fill out a federal tax form, and I recently cried in a Home Depot. The triple-digit age range feels, to me, like some mythic distant qualifier -- an unachievable goal. A hundred years of taxes sounds utterly implausible. That said, 102-year-old Irene O'Shea is giving aging a rebrand. This past weekend, she became the world's oldest skydiver, plunging 14,000 feet through the air over Australia to raise money for charity. Conversely, I drank a lot of whiskey and took a nap this weekend. 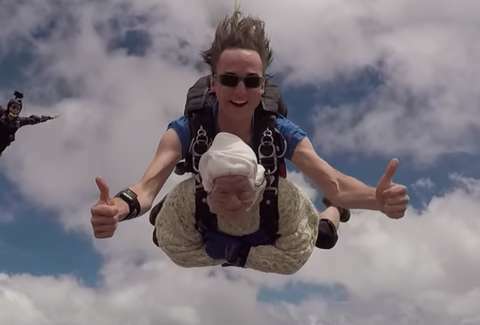 O'Shea, daredevil that she is, went skydiving for the first time on her 100th birthday in her hometown of Athelstone, Australia, and she's made an annual tradition of taking the leap every year since. The SA Skydiving instructor who accompanied her on her record-setting free fall told ABC that the descent "went smoothly," and that O'shea was "an absolute joy to have in the dropzone." This is a remarkable sexual innuendo, but it was, of course, meant literally. Philanthropy-wise, O'Shea was hoping to use her stunt to raise money and awareness for the Motor Neurone Disease Association of South Australia. Years ago, her daughter died of a motor neuron disease, and now, mother and daughter both will go down in history. "As far as I’m concerned I’m the same as everyone else, just a normal person," O'shea told a local news reporter immediately after the jump, when asked if she would classify herself as an adrenaline junkie. It is also important to note that she wore a handsome, cable-knit, turtle-neck sweater for her ruthless death dive. As Tyra Banks might say: skydive, but make it fashion.